Working with lots of images can sometimes have problems. You've tried the icon view, and various contact sheet methods. Both Photoshop and Photoshop Elements have their own built in image browsing utilities -- but nobody has come up with the light table functionality we enjoyed for decades in the professional world. Now, the latest digital LightTable makes this experience available with an unlimited virtual canvas application for working with images! LightTable lets users layout, inspect and compare images. Images can be resized, repositioned, layered and aligned allowing users to discover different storytelling perspectives. The 3.0.1 Update introduces gesture-based manipulation of canvas items, consolidates the user interface and provides several stability enhancement bug fixes. With this release, we continue to refine LightTable as a tool for photographers, editors and designers who need to explore visual possibilities interactively ... To provide a more focussed experience for repeated tasks, we consolidated the placement of elements on the user interface and we added gesture support for doing magnification. We have also increased canvas size to provide a larger working area for manipulating image items. Unlimited Canvas: The LightTable Virtual Canvas automatically expands to accommodate any number of images. Layout Tools: LightTable provides the tools to align, resize or re-order items or groups of images relative to the canvas or other images. Canvas Automation: Duplicate, replicate and automatically arrange images using built-in canvas automation functions. Image Effects: More than 40 built-in image effects are available to apply to items on the canvas. 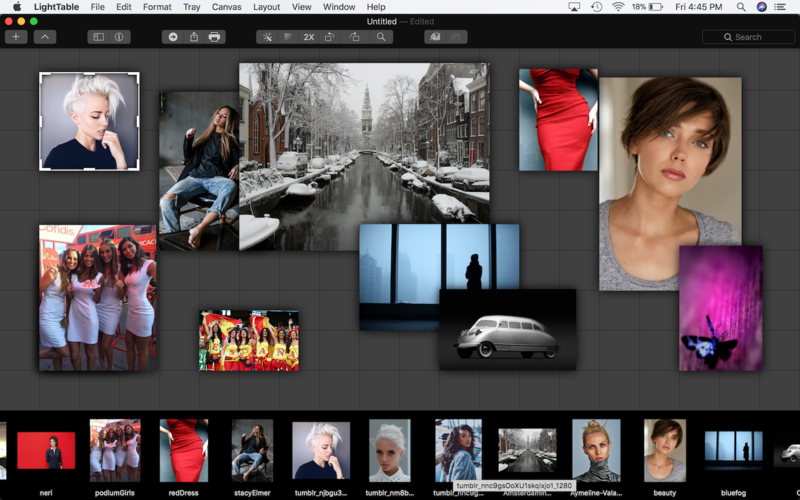 Canvas Export: Capture the entire canvas layout as a single image which can then be exported in a variety of formats. Sharing: Share your canvas with other applications or directly to Facebook, Twitter and other popular internet services. 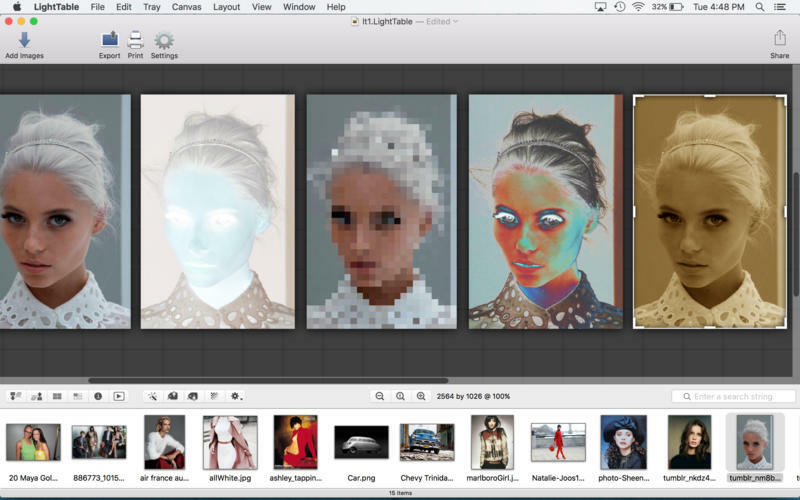 LightTable 3.0.1 is available for $19.99 USD (or equivalent amount in other currencies) and is available worldwide from the Mac App Store in the Photography category. Charlotte, North Carolina - Macintosh Applications for video, images and quartz compositions for creative professionals. einstein's legacy v2.0, LLC is located in Charlotte, NC. Copyright (C) 2011-2016 einstein's legacy. All Rights Reserved. Apple, the Apple logo, Macintosh, iPhone, iPod, iPad and Mac OS X are registered trademarks of Apple Inc. in the U.S. and/or other countries. Other trademarks and registered trademarks may be the property of their respective owners.